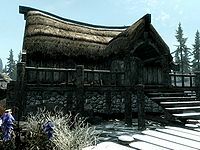 Thonnir's House is the residence of Thonnir and his son Virkmund in Morthal. They live in this simple, one-room house at the center of Morthal. The house is to the north of the Thaumaturgist's Hut. The are two deathbell bushes around the building. Two flights of stairs lead up to the decking at the front, which has a wooden bench against the building and a pile of firewood beside it. To the right are a couple of small wooden boat that have been dragged out of the water and overturned for storing. At the end of the jetty that runs in front of the house a small wooden boat has been moored. On your left when entering is a long wooden table holding two bottles of alto wine, two bottles of Nord mead, two loaves of bread and two chicken's eggs, with a fish barrel to the left and a basket containing two leeks. To the right of this is a set of shelves holding two more leeks, four potatoes, several pieces of cheese on top and hidden under basket on the bottom shelf is a copy of the Pickpocket skill book Aevar Stone-Singer. Above the shelves are two garlic braids, two bunches of elves ears and two bunches of frost mirriam all hanging from the ceiling. To the left of the shelves, hanging from the ceiling is a rack holding three rabbits. In the southwestern corner is a food barrel and next to this against the west wall is a tall wardrobe and an unlocked chest containing minor loot. In the northwestern corner is a round wooden table holding two bottles of Black-Briar mead. Coming out from the north wall is an owned double bed, where Thonnir sleeps. There is a large fireplace opposite the door in the middle of the north wall. On the mantlepiece there is a steel sword and in front of the hearth a cooking pot on a stand. To the right of the fireplace, hidden behind a basket is a unique item identified as Michaela's Flagon. In the northeastern corner, against the east wall is a single owned bed where Virkmund sleeps. Next to the bed is a lute and a pair of drums are at the foot of the bed. In the southeastern corner is a square wooden table and two chairs holding a flute, a sweet roll and three bottles of Nord mead. This page was last modified on 8 October 2018, at 23:21.